Altogether 783 000 electric vehicles were sold globally in January-June – China leading the way. Many of the fastest growing markets are new countries stepping into the EV game, such as Finland with 148% growth during the first half of 2018. The global goal is to hit the mark of 5 million electric cars on the roads by the end of 2018. EV statistics include both battery electric vehicles (BEV) as well as plug-in hybrid electric vehicles (PHEV) sales. 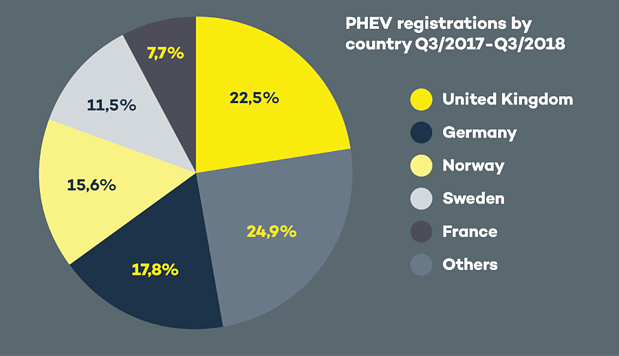 In countries where the overall amount of EV market is new, PHEV's are more popular, but the mix of fully electric cars and plug-in hybrids varies a lot. European average is that the fully electric vehicles cover 51% of the EV sales. China keeps maintaining its position as the largest growing market for the passenger plug-in vehicle sales, which are expected to reach over 1.1 million vehicles during 2018. During H1/2018, over 370 000 vehicles were sold in China – three times more than in the US. However, the growth in China is expected to slow down a little during the latter part of 2018, due to new requirements of EV range and battery capacity. Altogether 783 000 electric vehicles were sold globally from January to June in 2018. The growth has been 66% higher than in 2017. Based on this expansion, the EV sales will surpass 2 million during 2018, meaning overall 5 million electric cars will be driving around the globe. In Europe, 291 000 plug-in vehicles were sold during January-September, including both BEV's and PHEV's. 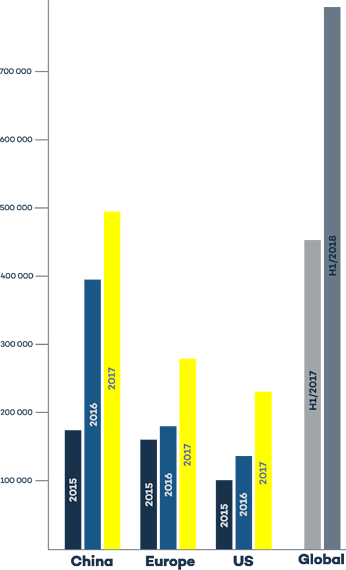 Formerly approximately half of the sales have been fully electric vehicles, but in September 2018 the amount reached a record-breaking 62%. The market share of light plug-in vehicles was 2.7% in Europe in September 2018. 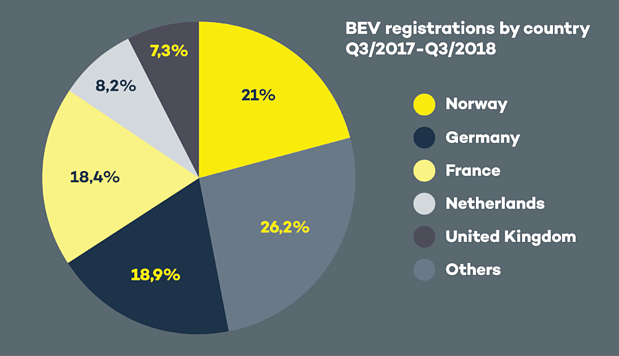 Norway continues to be the global leader with the largest market share of EVs compared to ICEs, whereas other Nordic countries follow the lead. Also German has an overall big impact on the European statistics, with a large market size and 52% growth in H1/2018. Statistics from EV-Volume and EAFO. 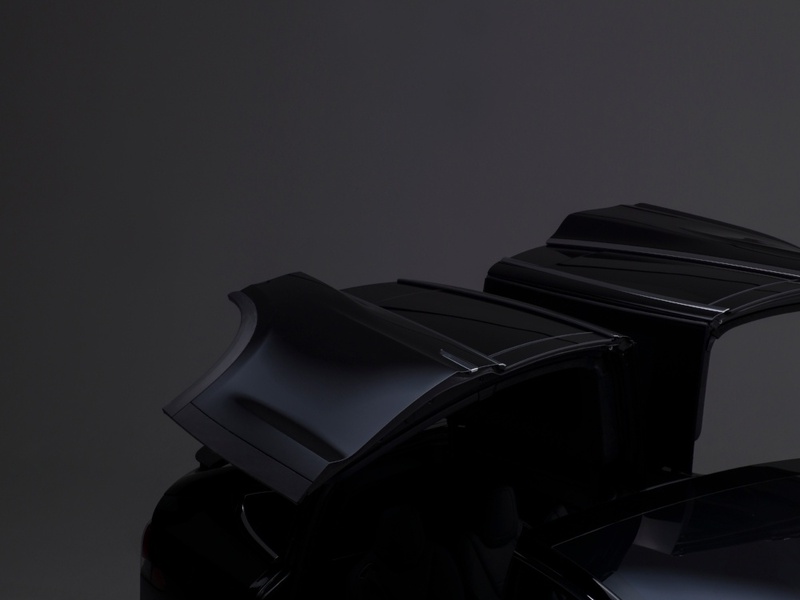 Want to learn more about electric car charging? Check out our guide about the basics of EV charging.